25 Dec 15: Santa and his team of Elf helpers have provided the latest version (3.2.0) of the free FISTS Log Converter program for Windows. This version includes the 2016 EuCW Snakes & Ladders, EuCW QRS Week, FISTS CW Club Europe Ladder, and FISTS CW Club Europe QRS Fifth Sundays on-air activities. This version also makes it easier to get started with FISTS Awards by including QSOs logged without a club member number. The program is available from the download web page. Many thanks to the team of Elf helpers: Alex PA1FOX, Peter G4LHI, Robert DM4RW, Richard G0ILN, Andy SP9NLI, Pete M5ABN, and Dave G0DEB. 25 Dec 15: Happy Christmas from all at FISTS CW Club! Please join us in the final 2015 FISTS CW Club Europe Ladder sessions: Sunday 27 December 1400-1600 & 1800-2000 UTC. 11 Dec 15: FISTS member Robert Tatlow, a veteran of D-Day at Normandy, has been awarded the Medaille de la Legion d'Honneur, France's highest award for bravery. For a full article, see the IOMToday website. Robert enjoys making Morse keys and some of his work can be seen in the Autumn 2013 Key Note on pages 33 and 34, and on the cover of the Autumn 2012 Key Note. 11 Dec 15: The FISTS Brasspounder December 2015 newsletter has just been published. Brasspounder provides the results and comments for FISTS CW Club on-air Activities in Europe/UK. This edition includes the latest Ladder 2015 results and the final Fifth Sunday 2015 results. 06 Dec 15: Now that FISTS CW Club Eu's Straight Key Week 2015 has finished, please don't forget to submit your logs (last entry date is 01 January 2016). Logs can be submitted directly by FISTS Log Converter or sent in by email. The results will be published around mid-January. 27 Nov 15: Straight Key Week is almost here! Please join us in the one of the most popular FISTS CW Club Europe Activities, running from 00:01 on Sunday 29 November to 23:59 on Saturday 05 December 2015 UTC. Also on Sunday 29 November is FISTS CW Club Europe final 2015 Fifth Sunday Activity at 13:00-17:00 UTC. QSOs using a straight key or sideswiper can be claimed for both Fifth Sunday and Straight Key Week. Note: you can contact the same station more than once per day provided it is on different bands. 19 Nov 15: FISTS member Ian G4XFC is giving a talk at the Leicester Amateur Radio Society (UK) on Monday 23 November at 19:30 entitled "Cracking the Code". This will be a very comprehensive talk on learning Morse code and increasing Morse speeds. 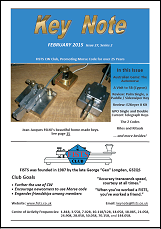 It includes tips for Morse Trainers and Radio Clubs starting a Morse Group. If you would like Ian to give this talk at your club, he is willing to do this within 60 miles of Market Rasen (Lincolnshire). 19 Nov 15: "The 1Watter" QRPp CW Transceiver kit from Kits and Parts dot Com is now available for 80m (approximately 3.557 to 3.562 MHz), giving a total of eight versions of the kit: 10m, 15m, 17m, 20m, 30m, 40m, 80m, & 160m. It provides 1 Watt output using 12 VDC. The design is dual conversion with full QSK and includes a built-in keyer IC. Ofcom has agreed to this request and will permit Radio Amateurs with a Main Station Address in Cornwall to use of the RSL throughout 2016. In common with comparable past temporary RSLs, it will be available for all classes of Amateur Radio licences, including stations participating in contests. We shall authorise the use of 'K' by varying individual licences, upon application by licensees via the website of the RSGB. We are grateful to the RSGB for making this facility available. Eligible licensees will be able to use the RSL 'K' anywhere within Cornwall, including at an alternative address, a temporary location, mobile or maritime mobile though Maritime Mobile use would, as usual, be limited to holders of the Full licence. This year's Christmas Key is a miniature camelback, harking back to the late 19th century and the golden age of telegraphy. The key is hard- chrome plated on an oval base, and has a black turned ebony knob. Nobody knows the original reason for the "camel hump" in the key lever (I have my suspicions), yet it became a tradition and is symbolic of telegraph keys of that era. Our 2015 Christmas Key has a fully developed arch in the lever, which adds perhaps 15% to the mass of the lever, giving it the feel of a larger key. It is nicely balanced and very easy to set up, adjust, and operate. For more information, see the Morse Express newsletter. 18 Nov 15: Morse Express (USA) has made its new Fall 2015 General Catalogue available online as a PDF, or a paper copy can be ordered (USA only). 18 Nov 15: FISTS CW Club members Claudio IZ0KRC and Vito IZ0GNY have organised the Third National Telegraphy Conference, which takes place in Rome, Italy, on Saturday 5th December 2015, 9:30 to 16:00. Further information is available on the Convention's website. Any visitors staying in Rome are very welcome. This year the event has been organized along with the ham group R.A.I. (Italian Radio and Television) and is being held in their building. In the morning there will be topics concerning the ham world and in the afternoon topics related to telegraphy. 18 Nov 15: Please join us in FISTS CW Club Europe's Ladder sessions: Sunday 22 November 1400-1600 & 1800-2000 UTC. 10 Nov 15: The FISTS Brasspounder November 2015 newsletter has just been published. 07 Nov 15: Please join us in FISTS CW Club Europe's Ladder sessions: Sunday 8 November 1400-1600 & 1800-2000 UTC. 06 Nov 15: The RSGB Marconi CW 2m Contest is this coming Weekend, 7 November 1400 UTC - 8 November 1400 UTC. It is part of a Europe-wide contest and is the third out of three annual RSGB VHF CW contests (4m, 6m and 2m). 26 Oct 15: "The 1Watter" QRPp CW Transceiver kit from Kits and Parts dot Com is now available for seven bands: 10m, 15m, 17m, 20m, 30m, 40m, & 160m. 24 Oct 15: Please join us in FISTS CW Club Europe's Ladder sessions: Sunday 25 October 1400-1600 & 1800-2000 UTC. UK members: don't forget that the clocks go back overnight as we switch to GMT! Activity is typically around 3.558, 7.028 and 14.058 MHz. Exchange a minimum of: name, RST, QTH, & member number (if applicable). 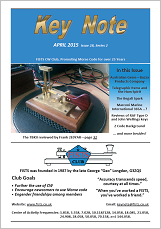 20 Oct 15: The September 2015 FISTS CW Club Down Under newsletter is now publicly available. FISTS Down Under is the Australian & New Zealand Chapter of the FISTS CW Club. If you are a current FISTS Member and would like a copy of the October newsletter, please send an email to FISTS Down Under . 20 Oct 15: The October 2015 edition of the 'morsEAsia' newsletter from FISTS CW Club East Asia is available. 20 Oct 15: The FISTS Brasspounder October 2015 newsletter has just been published. 08 Oct 15: Stampfl Morsetasten (Switzerland) has a new straight key available, the STM-11 Serie 'ORO'. At the time of writing, the Stampfl website doesn't have an up-to-date description of the key. 08 Oct 15: Please join us in FISTS CW Club Europe's Ladder sessions: Sunday 11 October 1400-1600 & 1800-2000 UTC. 08 Oct 15: The FISTS CW Club Americas Fall Unlimited Sprint takes place on Saturday 10 October 1700-2100 UTC on 80m, 40m, 20m, 15m & 10m. 04 Oct 15: FISTS CW Club will be at the Great Northern HamFest (UK) on Sunday 25th October 2015, so please come and say hello. The doors open at 10:00am and maps etc. are available from the Great Northern HamFest website. 02 Oct 15: A 160m version of the "The 1Watter" QRPp CW Transceiver kit is now available for $46. VXO frequency range is approximately 1.805 to 1.812 MHz. As per the 17m, 20m and 30m versions, it provides 1 Watt output using 12 VDC. The design is dual conversion with full QSK and includes a built-in keyer IC. 02 Oct 15: The FISTS CW Club Americas Fall Slow Speed Sprint takes place on Saturday 03 October 1700-2100 UTC on 80m, 40m, 20m, 15m & 10m. Maximum speed is 13 wpm. 26 Sep 15: The RSGB, the UK's national radio society, has started an online survey, inviting UK amateurs to fill it in. It doesn't require RSGB membership and can be anonymous. There is a question that mentions CW! 26 Sep 15: Please join us in FISTS CW Club Europe's Ladder sessions: Sunday 27 September 1400-1600 & 1800-2000 UTC. 21 Sep 15: FISTS member Dan M0TGN has made a Morse tutor based on an Arduino and inspired by the Datong tutors of yesteryear. His blog entry about the Arduino Morse tutor describes the unit and includes an explanatory video demonstrating it in use. 21 Sep 15: A 17m version of the "The 1Watter" QRPp CW Transceiver kit is now available for $46. VXO frequency range is approximately 18.069 to 18.087 MHz. As per the original 20m and 30m versions, it provides 1 Watt output using 12 VDC. The design is dual conversion with full QSK and includes a built-in keyer IC. 18 Sep 15: A 30m version of the "The 1Watter" QRPp CW Transceiver kit is now available for $46. VXO frequency range is approximately 10.101 to 10.119 MHz. As per the original 20m version, it provides 1 Watt output using 12 VDC. The design is dual conversion with full QSK and includes a built-in keyer IC. 17 Sep 15: The results for the 2015 IARU HST (High Speed Telegraphy) Championship are available. It is reported that a new record in the "Receiving mixed text - males" category was achieved by Siarhei Shviadko from Belarus at 250 cpm (50 wpm). 16 Sep 15: GHD (Toshihiko Ujiie JA7GHD) has a new dual lever paddle key, the GD509F. This is an updated version of the GD507F with ten areas of improvement. The key uses light sensors rather than mechanical contacts. The base is chrome plated, 100mm x 100mm, and the key weighs about 1.2kg. At the time of writing it is only available in Japan. 16 Sep 15: Rocky 3.8 has been released by Afreet Software, Inc. (Alex VE3NEA). This version works only on Windows Vista and above and uses the WASAPI interface to talk to the soundcards. Try this version if v.3.7 does not work properly with your soundcard. Rocky is a freeware CW and PSK31 SDR transceiver program for use with SoftRock radios. 16 Sep 15: In the ongoing saga of GK, MK, & 2K prefixes ("RSL K") for optional use within the UK county of Cornwall, Poldhu Amateur Radio Club has announced that it has applied for these on a temporary basis for one year starting on 01 January 2016. The response from the UK licensing authority, Ofcom, is awaited. 16 Sep 15: Italian chess player 'cheats' using Morse code and spy pendant. Alice Philipson, Rome, reports in a "The Telegraph" article that an Italian chess player has been expelled from one of Italy's most important tournaments after he allegedly used Morse code by batting his eyelids and wearing a spy pendant containing a hidden camera to communicate with an accomplice. 14 Sep 15: The FISTS Brasspounder September 2015 newsletter has just been published. 03 Sep 15: HI HI: LOL of the 19th century? An article LOL in the age of the telegraph by Lauren Collister, Electronics Publications Associate at University of Pittsburgh, on THE CONVERSATION website, looks at short forms and abbreviations used in the early days of Morse to make messages as concise as possible - a predecessor to today's textspeak. FISTS Down Under is the Australian & New Zealand Chapter of the FISTS CW Club. If you are a current FISTS Member and would like a copy of the September newsletter, please send an email to FISTS Down Under . 02 Sep 15: Please join us in FISTS CW Club Europe's Ladder sessions: Sun 13 September 1400-1600 & 1800-2000 UTC. Activity is typically around 14.058, 7.028 and 3.558 MHz. 02 Sep 15: FISTS CW Club Americas G3ZQS Memorial Straight Key Contest starts on Friday 4th September 23:00 UTC and runs until Sunday 6th September 23:00 UTC. The new version has separate lever tension adjustment for left and right movement like the flagship Morse Dirigent. Most operators will want the left and right motions to feel exactly the same, and in order to do that you have to set slightly heavier tension on the left or thumb side, because the thumb is stronger than the fingers, Precision factory adjustment of the self-centering mechanism makes this outstanding single lever paddle capable of sustained high- speed operatio. Schurr/Scheunemann paddles and keys have always been supplied without a plug. We have shielded 1/8" and 1/4" stereo plugs available, and for a nominal fee we will install a plug on the cable for you. Be sure to let us know how how you want it wired! After a few years without a semi-automatic "bug" key in the GHD lineup. It is great to see that the Japanese keymaker has brought a new one to the market. Telegraph Key made a real name for itself as a maker of bugs (semi-automatic keys). Earlier GHD bugs had a terrific reputation, and it is great to see that GHD has brought a new one to the market. 01 Sep 15: For the Fall of 2015, N3ZN Keys has introduced all new colors and color combinations. Shown in the photograph is the popular ZN-SLR single lever paddle. New colors shown are Silver Metallic with ClearCoat and Gold Metallic with ClearCoat. These colors are available on round base models only. Fingerpieces are available in red, blue, or black carbon fiber. 30 Aug 15: The new QRPme (USA) Limerick Paddles with built in PicoKeyer kit is a quick build kit employing 'Limerick' style construction. It was developed as a Buildathon kit for the NEQRP Buildathon at the 2015 New England Regional Convention. Limerick style construction was developed by W1REX as a form of Manhattan style construction where the pads and traces are all preformed using commercial pcb fabrication techniques including a full solder mask and silk screen but without the drilled holes for components. In essence, a surface mount board for through hole components. 29 Aug 15: FISTS CW Club will be at the Telford HamFest (UK) on Sunday 6th September 2015, so please come and say hello. 29 Aug 15: Please join us in the FISTS CW Club Europe Fifth Sunday Activity on Sunday 30 August, 13:00-17:00 UTC. Idiom Press is for sale, and we are suspending normal operations. New orders will not be accepted. Customers with existing orders will be contacted by email. To all our customers and friends, thank you for your business and your support. 13 Aug 15: Kits and Parts dot Com (W8DIZ) has introduced "The 1Watter", a 20 meter QRPp Transceiver kit for $44. It's designed for 1 Watt output on 20 meters using 12 VDC. VXO Frequency Range is approximately 14.057 to 14.061 MHz. Full QSK, Dual Conversion Design. Includes built in keyer IC. This transceiver was designed for home and portable operation. The name of this radio is "The One Watter" or "1Watter". The Xcvr has low noise and is very sensitive and selective. The VXO covers both sides of the standard 20 meter QRP calling frequency. The PCB size is only 2.5" (63.5 mm) by 3.8" (96.5 mm). 08 Aug 15: The FISTS Brasspounder August 2015 newsletter has just been published. Brasspounder provides the results and comments for FISTS CW Club on-air Activities in Europe/UK. 06 Aug 15: Please join us in the FISTS CW Club Europe's Ladder sessions: Sun 9 August 1400-1600 & 1800-2000 UTC. 05 Aug 15: The PFR-3B three band QRP CW Transceiver Kit is an updated version of the PFR-3 from Pacific Antenna. The PFR-3B contains a rotary encoder for tuning and other minor changes to improve the performance. The transceiver is VFO-controlled and covers 40m, 30m and 20m. It provides 5 Watts of CW and includes a built-in keyer, SWR indicator and balanced line tuner. 04 Aug 15: Karl Zuege KB1DSB, FISTS CW Club Americas Chapter President, has decided to retire from his duties as of Aug 1, 2015. The Americas Chapter Board of Directors express our thanks to him for all the hard work he has done for the chapter over the last year and a half and wish him good health and good DX in his retirement. As of Aug 1st 2015, Dennis Franklin K6DF will be "Acting" Americas Chapter President. In the months ahead, the Board will search for a permanent replacement for President, continue to expand the membership, and work to increase participation on the CW bands. 04 Aug 15: The July 2015 FISTS Down Under newsletter is now publicly available. FISTS Down Under is the Australian & New Zealand Chapter of the FISTS CW Club. If you are a current FISTS Member and would like a copy of the August newsletter, please send an email to FISTS Down Under . Even if you only had one QSO or feel that you can't win, it's really helpful to send in logs to encourage others to join in. See the Activity Calendar web page for details on sending in FISTS Eu activity logs. 01 Aug 15: The July 2015 Key Note is now available to all current FISTS CW Club members. NARSA Norbreck Rally, Blackpool 2015. Breathing life into an icon: the FT-101. Book review: The Radio Officer's War. A Go-Box for my FT-817. 30 Jul 15: UK amateurs: The closing date for comments on the RSGB 2016 Contests White Paper, which will determine the changes to be incorporated in the rules for 2016 RSGB contests (7th August) is rapidly approaching. If you have any comments to make, please make them by then. The White Paper, which includes the e-mail address to which comments should be returned, is available here. 23 Jul 15: Please join us in the FISTS CW Club Europe's Ladder sessions: Sun 26 July 1400-1600 & 1800-2000 UTC. 18 Jul 15: At Dayton 2015, American Morse Equipment introduced its new Camelback Key. MIL-spec Anodized Aircraft Grade Aluminum. The precision machining and modern materials allow for a straight key with amazingly smooth and precise action. The ball bearings provide nearly frictionless motion with seemingly zero play. The extremely strong neodymium rare earth magnet provides return force from zero to very heavy. The weighted hardwood base adds to the solid feel and keeps the key planted. The AME Camelback comes fully assembled with choice of available hardwoods, currently African Paduc, Walnut, or Maple. 17 Jul 15: Jackson Harbor Press (Chuck WB9KZY) has introduced the Grandson of Zerobeat kit, an update of the original Son of Zerobeat kit. Grandson of Zerobeat has 9 LEDs which graphically indicate the frequency of a received CW audio tone. Adjust your transceiver's frequency until the two center green LEDs light up and you are within +/- 10 Hz of zero beat with the transmitting station. one pot audio detector setting. board size 2.1 by 1.7 inches. offset frequency setable from 400 to 1200 Hz with a switch press. default offset frequency is 600 Hz. all board mounted parts including machine pin sockets come with kit. just add your metal enclosure, +12V power jack, audio jack and switch to complete the kit. 11 Jul 15: Please join us in the FISTS CW Club Europe's Ladder sessions: Sun 12 July 1400-1600 & 1800-2000 UTC. 08 Jul 15: The Marine Radio Historical Society (MRHS) will hold its annual "Night of Nights" event, in which historic maritime CW stations such as KPH and WLO return to the air for a few hours on July 13 UTC (July 12 in US time zones) along with some US Coast Guard stations. The event commemorates the days when coast and shipboard station operators transmitted their message traffic via Morse code. A pair of Amateur Radio stations - K6KPH and W4WLO - will be active on CW as well, and QSL cards will be sent to those who copy the text of the maritime stations' CW signals or work the ham stations. The maritime stations shut down in the late 1990s, but the MRHS has resurrected KPH and attempts to preserve the history of the era. 08 Jul 15: The FISTS Brasspounder July 2015 newsletter has just been published. Brasspounder provides the results and comments for FISTS CW Club on-air Activities in Europe/UK. 07 Jul 15: The July 2015 edition of the 'morsEAsia' newsletter from FISTS CW Club East Asia is available. 04 Jul 15: HamGadgets (USA) has released Version 2.0 of its innovative Ultra PicoKeyer kit. Additionally, for European purchasers, the kit will be available from Funk Amateur (Germany). Firmware changes include include QRSS mode and two new 63-character MYCALL memories. These can be recorded through the setup menu and used in a message with the /Y and /Y2 message commands. MYCALL1 can also be sent with a button combination. This effectively gives you five messages that you can send with the press of a button (or two, in the case of MYCALL1). QRSS mode lets you set the speed in a message to any QRSS speed mode, from 1 to 255 seconds per dot. The paddle timing is also "relaxed" when recording a message, just a bit. After a lot of deliberation I have found someone who I know will uphold the high product quality and customer service I tried to maintain during the 9 years I made VIZKEYS. I have found this quality in Curtis Nixon / KU8L. I know you will give him your support and business in the coming years. Thank you for all the nice reviews and word-of-mouth advertising you gave to me over the years. 01 Jul 15: The UK licensing authority Ofcom has decided not to allocate the regional secondary locator letter 'K' permanently to the English county of Cornwall (e.g. 2K0QQQ, MK0QQQ, MK6QQQ). It has however offered to allocate it on a temporary basis for a period of up to one year. A copy of the Ofcom letter is available online. 01 Jul 15: The June 2015 FISTS Down Under newsletter is now publicly available. FISTS Down Under is the Australian & New Zealand Chapter of the FISTS CW Club. If you are a current FISTS Member and would like a copy of the July newsletter, please send an email to FISTS Down Under . 01 Jul 15: The FISTS Americas Summer Slow Speed Sprint takes place on Saturday 04 July 0000-0400 UTC on 80m, 40m, 20m, 15m & 10m. Maximum speed is 13 wpm. 26 Jun 15: Listen out on 2m CW for FISTS CW Club HQ station GX0IPX located in Milton Keynes during the FISTS Two Metre Activity on Saturday 27th June 1500-1600 UTC. Note that this is the final weekend of the 2015 2m CW Activity. 26 Jun 15: FISTS CW Club Europe Weekend activities 27/28 June 2015. Two Metre Activity is around 144.058. Exchange a minimum of: RST, name, 6 character locator, & member number (if applicable). Ladder Activity is typically around 14.058, 7.028 and 3.558 MHz. 26 Jun 15: UK amateurs: The fourth annual RSGB 6m CW contest is Sunday 28th June, 0900-1200 UTC. 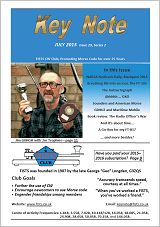 20 Jun 15: Morse Express (USA) has made its new Summer 2015 General Catalogue available online as a PDF, or a paper copy can be ordered (USA only). 20 Jun 15: The P3NS Dual Touch Paddle no-soldering circuit card is a new product from CW Touch Keyer. Create your own set of touch paddles using just about any conductive metal and wire them to the circuit card (up to 24" away). Ideal for custom paddle designs. 19 Jun 15: The EUCW Straight Key Day takes place this Saturday 20th June, 08:00-22:00 UTC. 13 Jun 15: FISTS CW Club Europe Weekend activities 13/14 June 2015. 12 Jun 15: The FISTS Brasspounder June 2015 newsletter has just been published. Brasspounder provides the results and comments for FISTS CW Club on-air Activities in Europe/UK. 04 Jun 15: For the fourth year in succession, FISTS CW Club is the leading club in EuCW QRS Week. Contributing to this were: Phil 2E0DPH, David 2E0EML, John 2E0JCY, Steve F/M0ZSM, Ray G0EML, Richard G0ILN, Mike G0POT, Peter G3JFS, Graham G3ZOD, Merv G4KLE, Peter G4LHI, Derek M0DRK, Peter M5ABN, and Erkki OH7QR. In the individual QRO category, Ray G0EML, Peter G4LHI, and Merv G4KLE achieved awards. In the individual QRP category, Phil 2E0DPH and Peter G3JFS achieved awards. Ray G0EML also achieved awards for "Most Readable Morse" and in the QRO category, "Special QSO Count". The full results are available at https://eucw.org/euqrs15.html. Thank you to all who took part, and please join in again next year. 02 Jun 15: The May 2015 FISTS Down Under newsletter is now publicly available. FISTS Down Under is the Australian & New Zealand Chapter of the FISTS CW Club. If you are a current FISTS Member and would like a copy of the June newsletter, please send an email to FISTS Down Under . 30 May 15: Hamcrafters (K1EL) has introduced the K-CPO kit, a versatile code practice oscillator that can be used with K1EL keyers or just about any keyer on the market. It has true sine wave output with adjustable frequency and volume. A connector is provided to drive an external speaker or headphones with plenty of clean output. RCA jack outputs on back with external power and speaker/headphone connector. Exclusive 'KeyerSync' allows you to chain several CPOs together to simulate 2 way or net operations. You hear what you are sending along with everyone else on the simple two wire network. 29 May 15: FISTS CW Club member Mark M6BRN has a new website with photographs and descriptions of items from his telegraph and crystal radio collection. 28 May 15: FISTS Europe Weekend activities 30/31 May 2015. Fifth Sunday Activity is typically around 14.058, 7.028 and 3.558 MHz. Exchange a minimum of: name, RST, QTH, & member number (if applicable). 27 May 15: The latest version (3.1.5) of the free FISTS Log Converter program is now available. This version fixes a bug related to display of EuCW Snakes & Ladders QSOs. FISTS Log Converter can read ADIF log files exported from logbook programs and create & submit entries for EuCW Snakes & Ladders, EuCW QRS Week, FISTS Awards, and FISTS Europe Activities. For those not currently using a logbook program, it includes an optional logbook of its own. The program is available from the download web page. Many thanks to Alex PA1FOX, Peter G4LHI, Robert DM4RW, and Richard G0ILN for helping with the design & testing. 22 May 15: FISTS CW Club Europe Weekend activities 23-24 May 2015. Saturday May 16 1400 to Sunday May 17 1400 UTC. Hope to work you bug to bug. 73 Tony G3ZRJ 7727. 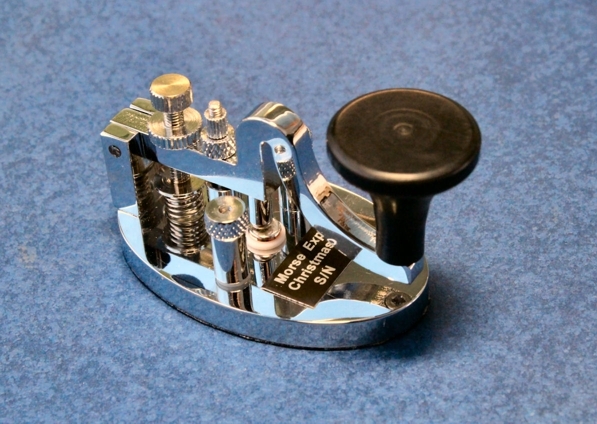 08 May 15: ARRL has partnered with Begali Keys of Italy to produce this limited edition key. Handsomely sculpted by designer Pietro Begali, I2RTF, this is a fully-functional key with paddles. All fixed parts are made from AISI 304 stainless steel. Contacts are made in solid 925/1000 silver (not plated). The carved aluminum lightweight finger paddles, with a 1:1 leverage ratio, are anodized in black. At the bottom of the base is a rubber ring to prevent slipping (four rubber feet are included which can be installed, optionally, into pre-drilled holes). 08 May 15: The RSGB 4m (70 MHz) CW Contest 2015 is Sunday 10 May 0900-1200 UTC. 08 May 15: FISTS CW Club Europe Weekend activities 09-10 May 2015. 08 May 15: The FISTS Americas Spring Unlimited Speed Sprint takes place on Saturday 09 May 1700-2100 UTC on 80m, 40m, 20m, 15m & 10m. There is no sending speed restriction. 08 May 15: The FISTS Brasspounder May 2015 newsletter has just been published. Brasspounder provides the results and comments for FISTS CW Club on-air Activities in Europe/UK. 02 May 15: The April 2015 Key Note is now available to all FISTS CW Club members. Marconi Marine International 365A ...? 02 May 15: Morse Express (USA) now has the Nye 320-001 Speed-X key in stock. 02 May 15: The April 2015 FISTS Down Under newsletter is now publicly available. FISTS Down Under is the Australian & New Zealand Chapter of the FISTS CW Club. If you are a current FISTS Member and would like a copy of the May newsletter, please send an email to FISTS Down Under . We are excited to resume operations as of May 1 providing Hendricks QRP Kits and in the very near future, we will be bringing back the entire Pacific Antenna line of antenna kits and parts. We very much appreciate the patience that has been shown as we worked through this transition and we look forward to serving the QRP community. See the EuCW Snakes & Ladders and the EuCW QRS Week web pages for details of sending in logs for them. 01 May 15: The FISTS Americas Spring Slow Speed Sprint takes place on Saturday 02 May 1700-2100 UTC on 80m, 40m, 20m, 15m & 10m. Maximum speed is 13 wpm. 30 Apr 15: Andy G0IBN now does GB2CW QRS transmissions, 5/7/10 wpm, on his "summer" frequency of 7035 (winter 3555) on Monday evenings at 20:15. He also calls "CQ QRS" afterwards as G0IBN for the inexperienced operator to build up confidence. 25 Apr 15: Congratulations to FISTS CW Club members Peter G4LHI and Pete M5ABN, who have been awarded the Begali keys in the EuCW Snakes & Ladders 2014/2015 activity. Peter G4LHI was the highest placed entrant taking into consideration number of locators and QSOs. Pete M5ABN won the draw for 10 or more entries submitted. The new season of EuCW Snakes & Ladders is now in progress (April 2015 - December 2015). 25 Apr 15: The EUCW QRS Activity Week takes place this coming week Monday 27 April 00:00 - Friday 01 May 23:59 UTC. The maximum speed is 14 wpm and any band can be used. QSOs must be at least 5 minutes long. For more information and a list of recommended frequencies, please see the EUCW QRS Activity Week web page. 25 Apr 15: FISTS CW Club Europe Weekend activities 25-26 April 2015. 13 Apr 15: The FISTS Brasspounder April 2015 newsletter has just been published. Brasspounder provides the results and comments for FISTS CW Club on-air Activities in Europe/UK. 10 Apr 15: QRP Labs (FISTS member Hans G0UPL) is providing a new Clock kit. A GPS receiver module such as the SKM61 can optionally be connected directly to the clock kit in parallel with the Ultimate3 kit. It can also operate independently without GPS, or with another 1 pulse per second (pps) signal source. The clock can be configured to display time, date, and various information decoded from the GPS serial data stream. Two Analogue temperature sensors an optionally be connected to the kit, so that temperature measurements can be displayed (for example, indoor and outdoor temperature). 10 Apr 15: FISTS CW Club Europe Weekend activities 11-12 April 2015. 07 Apr 15: The latest version (3.1.3) of the free FISTS Log Converter program is now available. This version fixes a bug related to the new season of EuCW Snakes & Ladders that started in April 2015. It also removes an error message that occurs when QSOs with 2SZ and 7QAA are considered for FISTS Awards. 06 Apr 15: The April 2015 edition of the "morsEAsia" newsletter from FISTS CW Club East Asia is available. This edition has a special focus on members' QTHs. "(April 2, 2015) RKR Designs, LLC of Longmont Colorado has announced that they have acquired the assets of Alpha Amplifier and TEN-TEC brands from RF Concepts. RKR plans to expand the product line, while continuing to service their customers that have enjoyed their products over the years." A585 Windy Harbour Junction Improvement - Long Delays. Traffic is being managed by a series of temporary signal control and a 30mph speed limit. From Wednesday 23 March 2015 the 4-way signals will again be in operation, with single file running. At all other times traffic management will consist of permanent signals and narrow lanes. Best routes to take to rally will be to use M55 J4, or if taking J3 off the M55 follow A585 to Mile Road turn left following the signs for Singleton then on to the junction of A586 / A585. Check out the Highways website for the latest information. 02 Apr 15: The March 2015 FISTS Down Under newsletter is now publicly available. FISTS Down Under is the Australian & New Zealand Chapter of the FISTS CW Club. If you are a current FISTS Member and would like a copy of the April newsletter, please send an email to FISTS Down Under . 01 Apr 15: FISTS will be attending the NARSA Rally at the Norbreck Exhibition Centre, Blackpool, UK on Sunday 12th April. 31 Mar 15: The new EuCW Snakes & Ladders season April 2015 to December 2015 starts tomorrow, 01 April 2015. Start date/time, end date/time, Callsign, Mode (CW), Frequency (MHz), RST sent, RST received, name, QTH, and a 4 or 6 character locator. It is recommended but not essential that name, QTH, and locator be exchanged over the air. There are potentially higher points if QSOs take place in the upper 10 kHz of the IARU Region 1 band plans' dedicated CW segments. For the full new rules, please see https://eucw.org/sl.html. The free FISTS Log Converter program version 3.1.2 or later for Windows can be used to create & submit entries for EuCW Snakes & Ladders. You can use its own logbook or import QSOs as ADIF files from other logbook programs. 29 Mar 15: Jackson Harbor Press (Chuck WB9KZY) has introduced the Keyall HV kit. The Keyall HV kit allows the owner of a keyer with a low voltage positive (NPN or n-channel MOSFET) keying transistor to drive the vacuum tube transmitters and transceivers of yesteryear. This unit will key negative voltage rigs (grid block keying) or positive voltage rigs (cathode keyed tube transmitters and conventional +13.8V powered solid state rigs). The output transistors and capacitor are rated at 1000 V and 3.1 A (3100 mA). 28 Mar 15: FISTS Europe Weekend activities 28-29 March 2015. 23 Mar 15: The FISTS Brasspounder February 2015 newsletter has just been published. Brasspounder provides the results and comments for FISTS CW Club on-air Activities in Europe/UK. Bencher, Inc. of Antioch Illinois announced the sale today of the Bencher Amateur Radio product lines to Vibroplex, LLC of Knoxville, Tennessee. This sale ends Bencher's presence in the amateur radio field, thus allowing the principals, Jere Benedict, President, and Bob Locher, (W9KNI) to move towards retirement. The product lines sold include the Bencher BY series of Iambic Paddles, (the world's best selling iambic paddle, with over 150,000 sold) as well as the ST series of single lever paddles, the Bencher Hex Paddle, the N2DAN Mercury Paddle, and the Bencher RJ series Hand Keys. Also included in the sale are the HK-1 Universal Hook-up kit and the YA-1 Low Pass Filter. Vibroplex has agreed to honor the manufacturer's warranties of all covered products, and to offer parts and support for these products as well. Jere Benedict and Bob Locher wish to express their gratitude to the amateur radio community for its interest and support since the sale of the first Bencher amateur radio products in the early 1970's. 20 Mar 15: FISTS Europe Weekend activities 21-22 Mar. 11 Mar 15: Vibroplex is now the exclusive USA distributor for the entire YouKits product line including the popular HB-1A and HB-1B QRP CW transceivers. They are stocking all items at their Knoxville, TN office for quick shipping to USA addresses. 11 Mar 15: The Mountain Topper Tri-Bander CW transceiver for 40m, 30m, and 20m is now available assembled from LNR Precision Inc. (USA). Developed by KD1JV, at 3.8" x 2.7" x 1" (LWH) this miniature VFO-controlled transceiver is around the size of a cigarette packet and provides 2.5 Watts (typical) with a 9 Volt power supply (minimum 6 Volt, maximum 12 Volt). 07 Mar 15: Morse Express (USA) has made its new Spring 2015 General Catalogue available online as a PDF, or a paper copy can be ordered (USA only). 06 Mar 15: The February 2015 FISTS Down Under newsletter is now publicly available. FISTS Down Under is the Australian & New Zealand Chapter of the FISTS CW Club. If you are a current FISTS Member and would like a copy of the March newsletter, please send an email to FISTS Down Under . 02 Mar 15: CW Touch Keyer is providing a new model, the P3BS. This is a paddle only! No electronic keyer. Press the "on" button and forget about turning it off. It shuts down by itself after 10 minutes if no paddles are touched. It also tells you when the battery or power source drops below 6.5V. The assembled PCB, LED, jack socket, and push button are supplied. You provide your own paddles that can be made from a conductive metal. Board size 1.5" by 1.4". 7 - 14 VDC operation. No electronic keyer. Open FET output for +13.8V, 60 mA or less keying (no grid block keying). Ideal for building into your custom projects. It outperforms any mechanical. I would like to announce that Hendricks QRP Kits has been sold to James Bennett and Kathy Long of Pacific Antenna and we have started the process of transitioning company operations. I will still be involved with the company as a consultant and they will be managing the day-to-day operation as the new owners. I enjoyed running Hendricks QRP Kits but it is now time to move on with full retirement. I would like to thank all of the customers and wonderful QRPers that I've met through the past 10 years of my business ownership. Stay tuned to this website for further announcements. The target date for reopening is April 1. Doug. 02 Mar 15: The Radio Officers Association is organising a radio special event that will be taking place from the lightship Planet which is berthed in Canning dock Liverpool (UK) during the month of May 2015 to remember the tragic sinking of the fine Cunard line ship R.M.S. Lusitania on May 7th 1915. R.O.A. have managed to obtain the special event radio callsigns of GB100MFA, MFA being the radio callsign of the Lusitania. Two stations will be on air simultaneously both for CW with some SSB. These two stations will be on amateur radio bands from 3.5 MHz to 28 MHz dependant on propagation conditions. R.O.A. will be assisted by members of the M.R.M.S.W. who were previously at Fort Perch Rock but now based on the Planet lightship in Liverpool. Even if you only had one QSO or feel that you can't win, it's really helpful to send in logs to encourage others to join in. See the Activity Calendar web page for details on sending in logs. 19 Feb 15: The February 2015 Key Note is now available to all FISTS members. 19 Feb 15: FISTS Europe Weekend activities 21-22 Feb.
13 Feb 15: Bananas for CW! Jari OH6DC has a video showing him using a paddle key made from bananas. The video not only demonstrates one of his highly unusual keys, but also showcases his excellent sending. For more information, see the banana key web page. RST, U.S. state or Canadian province or DXCC country, first name, FISTS member number or power output in Watts for non-members. 07 Feb 15: There is an interesting letter from Connie Hird to the Yorkshire Post recounting her experiences as a WWII Morse code wireless operator. 07 Feb 15: SAQ extra transmission on World Radio Day. World Heritage GRIMETON RADIO/SAQ will, hopefully, have a transmission with the Alexanderson alternator on VLF 17.2 kHz on international UNESCO 'World Radio Day' (WRD) on Friday February 13th 2015. The message concerning PEACE have been put together by over 200 citizens of Varberg via the "Varberg Calling for Peace" project, in Varberg, Sweden. Our amateur radio station (SK6SAQ) will be active with a special call sign for the day, "7S6WRD" where "WRD" stands for "World Radio Day". Frequencies : 7035 CW or 14035 CW, 3755 SSB. QSL to 7S6WRD via SM bureau. 06 Feb 15: The first ever FISTS Americas Winter Slow Speed Sprint takes place on Saturday 7th February 1700-2100 UTC on 80m, 40m, 20m, 15m & 10m. Maximum speed is 13 wpm. 06 Feb 15: FISTS Europe Weekend activities 07-08 Feb.
02 Feb 15: The December 2014 FISTS Down Under newsletter is now publicly available. 30 Jan 15: The latest version (3.1.2) of the free FISTS Log Converter program is now available. This version supports the new season of EuCW Snakes & Ladders that starts in April 2015. 28 Jan 15: The BBC iPlayer video Trusadh Series 6: 2. The Wave Messengers is a look at the use of Morse Code at sea. Former Radio Officer Hamish Taylor, of Harris, examines the importance of the seldom-mentioned sea messengers. Note: it will probably not be available outside the UK. The video, which is mostly in Scottish Gaelic with English subtitles, includes Morse code training, ship-to-shore radio, and a visit to the reconstructed ship's radio room at Sandford Mill Museum (Chelmsford). Many thanks to Phil M0BSJ for bringing this to our attention. 23 Jan 15: FISTS Europe Weekend activities 24-25 Jan.
15 Jan 15: New EZKeyer 3 kit from Four State QRP Group: Building on the popular EZKeyer and EZKeyer II, this third generation very capable Morse Code keyer has some additional features - a beautiful new easy building enclosure, a smaller footprint, new PIC microcontroller, Speed Pot, larger message memories, new printed circuit board layout, and large push button switches. All connectors, switches, the speed pot, and components are board mounted, making the keyer completely self contained on the board. No external parts or wires are required (excepting battery leads). See the kit's web page for more details and ordering information. We now have only 3 Czech Morse keys with minor scratches and/or slight rust, however the internals are as new. So if you want a key then please order by the 10th Jan 2015, after which the Paypal buttons will be removed. In Feb 2015 we will then carry out a final stock check and put the remaining keys up for sale. If you want any spare parts (springs, cables, etc), then now is the time to email and ask, thank you. I would like to thank all those who have purchased from us; and hope you continue to use your keys. It has been a pleasure to bring these keys to hams all over the world and I have enjoyed meeting and communicating with many new found friends. Have fun with CW, enjoy it and long may it continue. 10 Jan 15: FISTS Europe Weekend activities 10-11 Jan.
07 Jan 15: FISTS North America Members: You can now check if your dues are due on the website's new FISTS Expiration Date web page. If they are due, you can pay your dues online. Chelmsford Amateur Radio Society (Essex, UK) invite you to join their Morse classes which will be starting at 7pm on Thursday, January 15 at the Danbury Village Hall CM3 4NQ. 06 Jan 15: Kanga Products (Dennis G6YBC) is now selling plug-in band pass filter kits for the W1REX Texas Topper QRP/QRPP to 5 Watt amplifer. The kit includes parts and PCBs to build 3 filters for 80m, 30m, and 20m, enabling the amplifier to be used on these bands in addition to the supplied 40m band. 06 Jan 15: The January 2015 edition of the "morsEAsia" newsletter from FISTS CW Club East Asia is available. This edition includes Japan's new Band Plans, effective on January 5, 2015. "Hendricks QRP kits will be closing for a short time. I have to have some minor surgery done. I am fine and it is not life-threatening but I need to take care of it and take care of my health. We will be closed from now until March 1 which is the target reopening date. Thank you for all of your past business. All orders currently placed will ship in the next few days." 04 Jan 15: Starting in 2015 the FISTS CW Club North America is adding four new Slow Speed Sprints to the Sprint Program line up. Sprints will be held on the first and second Saturdays. The first Saturday will be the Slow Speed Sprint and the second Saturday will be the usual Sprint with no speed limit. The Slow Speed Sprint is a great opportunity to introduce our newer members to the fun of operating FISTS Sprints and for our old hands maybe to brush off those straight keys, cooties, side swipers, bugs, etc. and also join in the fun! In the Slow Speed Sprint, all operators should send no faster than 13 WPM and if someone is calling you or CQing at a slower speed, you should QRS to match their speed. That is the only change; all other rules, scoring, etc. will remain as for the usual Sprint! 01 Jan 15: Happy New Year from all at FISTS CW Club! This weekend, 3-4 Jan, we start with a new 6 month Two Metre Activity (Jan-Jun). Please note the time changes: Sat 15:00-16:00 & Sun 10:00-11:00 UTC. Activity is around 144.058. Exchange a minimum of RST, name, 6 character locator, & member number (if applicable). QSOs are friendly and conversational. Logs are welcome but not essential - the main objective is to enjoy the QSOs. Members from all FISTS Chapters are encouraged to join in; QSOs do not have to be with members of FISTS Europe. The FISTS Ladder and FISTS Fifth Sunday Activities also start afresh in 2015. Participants in the EuCW Snakes & Ladders activity, please be aware that the 2014/2014 activity continues until the end of March 2015. This is followed by a new activity running from 1st April 2015 to 31st December 2015. The EuCW ON5ME 160m party takes place on 3rd Jan 20:00- 23:00 UTC and 4th Jan 04:00 - 07:00 UTC. Last but not least, if you have achieved one or more of the FISTS East Asia 10th Anniversary Awards during 2014, please remember to apply for them on or before 15th January 2015.